A couple of years ago I managed to persuade my brother that he needed a woodburning stove for his newly converted barn - he didn't actually need much persuading, in fact he leapt at the idea. 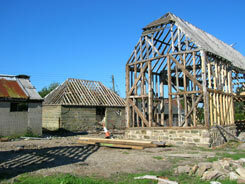 He has a plentiful supply of timber available around the farm to fuel a stove, mainly oak, but also some beech and chestnut. 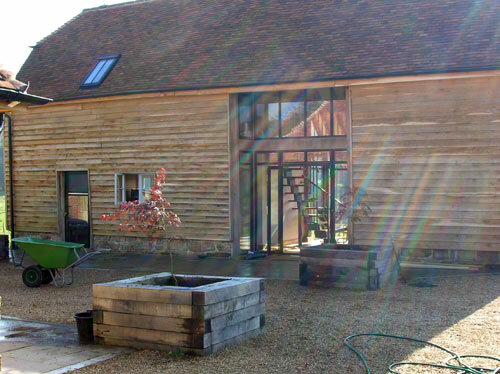 Although the building was a typical late 18th century Sussex barn, built of oak with peg tile roof, the planners were very keen that the conversion should reflect the building's original industrial history. They insisted that the windows were to be of the original design and size, and can you believe it they would not allow double glazing. 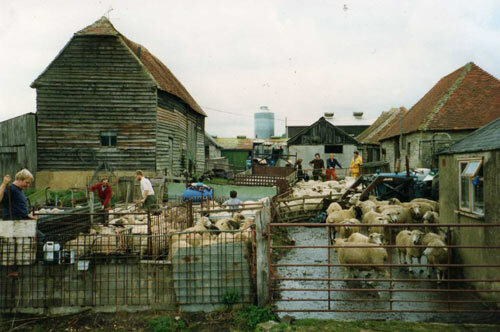 No doubt if the planners were consulted now they would say otherwise. The stairs too needed to be of a simple design, no solid timber glorified staircase would satisfy them. 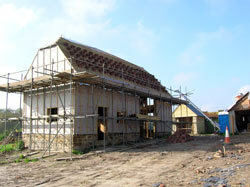 After the usual drawn out planning application and many months of building work the barn was finally made habitable. The time came for the stove to be installed. My brother had chosen the Romotop Stromboli in steel. 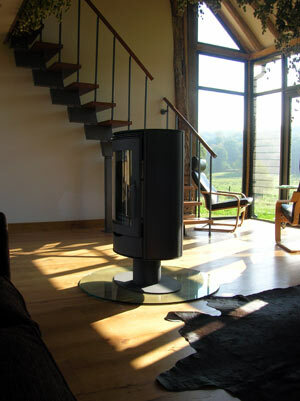 This cylindrical shaped stove was perfect for the barn with it's simple contemporary design. The stainless steel double skin flue system goes right up through the centre of the building adding interest to the interior, again keeping the industrial theme going. Two years on, the stove has proved to be everything my brother had hoped, and more. He loves going out collecting timber, bringing it back, cutting it into logs and stacking them up ready for the next winter - he says it gives him a much better workout than going to the gym and saves him on the membership. The stove has been in constant use other than in the very warmest months. Even in late May, when we had a family barbecue, the stove was lit again to warm up those who had been outside braving the cool evening. I have reminded him that summer is the time that he should be sweeping the flue and checking his stove over to be sure that it is ready for the autumn. I suggested that he might get his own set of nylon, bendy sweeping rods and brush head. This is what he would need for his flue system which has two bends in it allowing the flue to go out through the correct place in the roof. I have also suggested that he might want to consider investing in a spare glass panel. He doesn't need it now, and he may not need it for some time to come, but there is nothing worse than the glass breaking in your stove on Christmas Eve and you can't get a replacement for at least a fortnight. He is thinking about that one, curved glass panels do not come cheap.